A New Answer to Residual Limb Volume Change | CJ Socket Technologies, Inc.
SANTA BARBARA, CA, January 27, 2014 — Nobbe Orthopedics, Inc. Vol. 64 — Ask most any amputee the significant challenges to wearing a prosthetic limb, and residual limb volume change (RLVC) is sure to be part of the discussion. Simply put, changes in the size of the residual limb (stump), whether occurring gradually over time or fluctuating daily in response to lifestyle factors, compound the task of maintaining the secure socket fit essential to prosthetic success. The gradual changes, typically resulting from post-surgery edema subsidence, muscle atrophy or significant weight gain or loss, can be managed with a new socket or adjustments. However, the daily fluctuations caused by salt or water intake, rigorous activity, or just routinely using the prosthetic limb must be addressed on the spot if the prosthesis is to continue to perform as intended. As the residual limb loses volume during the day, the socket becomes unstable with resulting increased motion between limb and socket. Hydrostatic lift and weight-bearing efficiency are reduced, and the residual limb moves further into the socket with increased distal pressure, pain, and eventually skin shear and breakdown. Enter a radical new design, the CJ Socket, which gives the wearer the ability to loosen or tighten socket fit as required for residual limb volume change in seconds. The essential engineering difference in this innovation is a non-elastic but comfortable panel called a “sail” (due to the material’s similarity to that used in a Dacron boating sail), which comprises roughly half of the socket circumference, combined with a patient-adjustable Velcro closure. Rounding out the design is a rigid “J” shaped frame, which covers the remaining half of the residual limb, transfers weight-bearing forces from the prosthesis to the residual limb, and provides skeletal control. 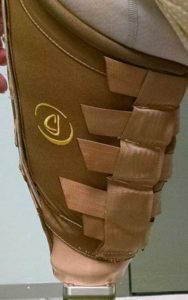 With a CJ Socket, adjustment for daily volume loss requires nothing more than adjusting several Velcro straps to maintain the optimal fit, which can be accomplished in a fraction of the time required for adding socks. This unique socket was first designed for transfemoral applications with the sail positioned posteriorly. 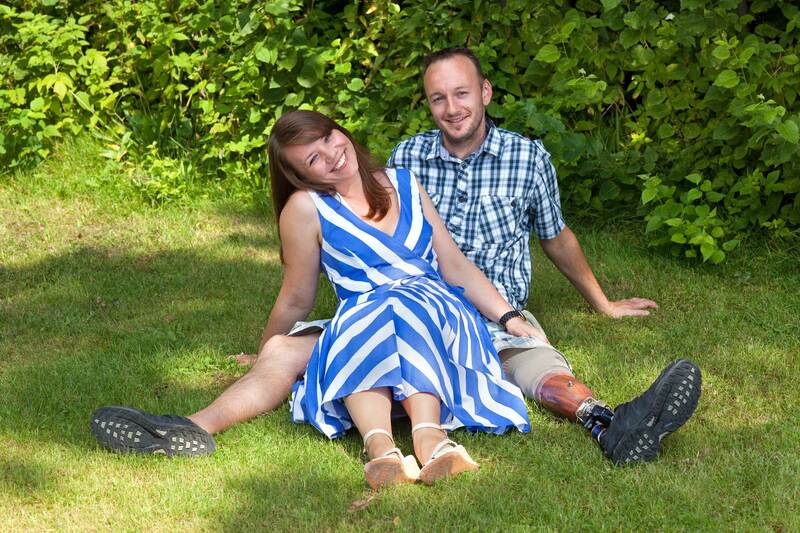 Above-knee amputees experience a particular challenge when sitting down. When a traditional rigid socket contacts a hard chair or toilet seat, the result is usually a combination of (1) discomfort and (2) loss of the total-contact seal that maintains the socket in place on the residual limb. But when sitting in a CJ Socket, the sail, which feels and reacts more like clothing than part of a prosthesis, flattens and conforms to the seat surface, allowing the thigh tissue to spread more naturally and definitely more comfortably. The result is a harmonious interface between anatomy and environment, and sitting on cloth beats sitting on hard plastic any day. 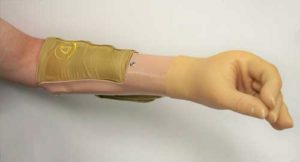 Subsequently, the design was successfully adapted for upper-extremity amputees, including those wearing myoelectric prostheses, who report the socket is lighter, less-restrictive and more comfortable than traditional sockets. 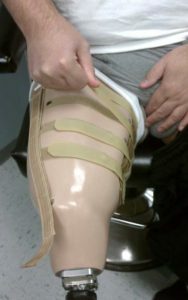 The concept is now being extended to below-knee applications as well.